Very good quality; holds its shape. Luxury White Goose Down Pillow. 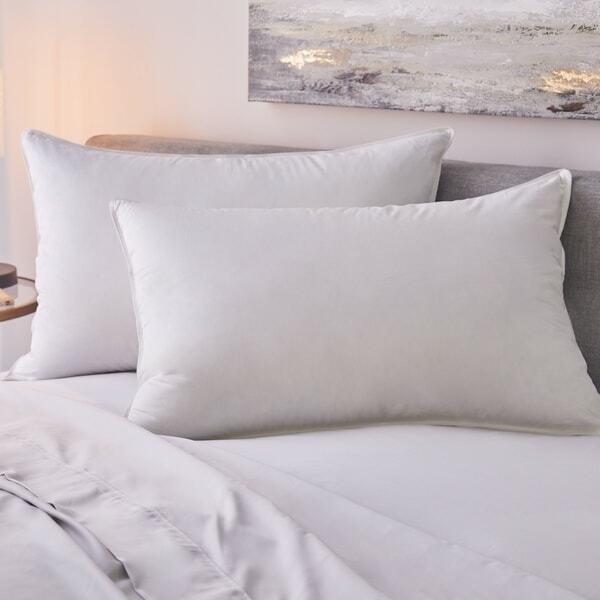 Luxurious 330TC 100-percent Cotton Sateen cover filled with responsibly sourced 700 Fill Power European White Goose Down. Double stitched edge piping ensures strength and durability for years to come. Available in Medium and Firm Density, Standard, Queen and King Size. Very pleased with this pillow. Well worth the money! Down filled with no worries about feathers that stick through the cover. Filling doesn't mat down. Provided great comfort all night long! Down pillows make for an exceptional night's sleep! I have only slept with down pillows for over 50 years and the goose down plus the sateen cover are truly superior to all the others! High quality stitching all around, plus being machine washable is better than everything!! Exceptional workmanship and touch. Supports your head and neck for relaxing and easing into sleep. Pricey but excellent quality! Downs make all the difference! For my support pillows I use a mix of downs and feather, but for the sleeping pillows downs only are the answer. I choose standard firm, and love it. Best pillows I've ever had. Nice big size, plump with filling. Super luxurious. Not inexpensive but very nice quality fabric,sewing,and fill. No feather leaks. Pretty firm but that's what I wanted. I'm finding,like most down,they soften a bit over time. Guests who've slept on them have commented on how great they are and asked where I got them. Very soft and comfortable. Can't compare to a polyester filled pillow. Just what I wanted. I sleep better with this pillow. The size looks well with my queen sized bed. This is my second pillow. And I'm in the process of replacing all of the current pillows in the house with this one. I am on a pillow campaign. Actually, think about it: When was the last time you replaced your pillow? We rely on them for a third of our lives but sometimes forget that they collect dead skin and dust mites. The filling inside will break down over time. Foam pillows need to be replaced every 6 months or so because they break down; a good down pillow like this one will last much longer with good care. So while this may seem like an expensive purchase, it actually pays for itself over time. Plus you will have a great night's sleep. I ordered the firm and although it is firm and luxurious it’s not what I wanted. I wanted that hotel, sleeping on a cloud pillow, and this pillow is like hard and soft at the same time. Good for some which is why it’s 4 stars but for me personally not what I wanted. Especially for the price. After hoping, searching, trying and buying, several different types of pillows with little or no satisfaction...I purchased two of these 100% goose down pillows. Folks, I have to confess that my hunt has ended. Even tho, a bit pricey ( remember you generally get what you pay for). These are absolutely the most comfortable pillows I have ever owned. The fill and loft could not be better. I would recommend these to anyone who is looking for a great night's sleep. I choose med fill and they are too puffy! A lot softer than what I would expect from a pillow classified as medium. Not horrible but don't sleep on it often. This is a great pillow. I slept great the first night. I think they are a great price. They will last a long time. Elva M.
Exactly as described. My neck was a bit strained moving up from soft down to medium. I have since adjusted just fine. Good buys. I used to buy from Cuddledown only when they had a sale. Even on sale these pillows were about half the price. Just what I as looking for. I have a bad neck and this pillow was just the right combination of softness and support. Would recommend it. Exceptional, best pillow we ever had. Wonderful pillow. I sleep better. It has good support but also forms to your head. Wish I had purchased this months ago - I have slept this well in ages! Great pillows for both of us! Worth every dollar spent. For a goose down pillow this is a pretty good deal. I was a little confused as I thought there were 2 but read it wrong. In all, I kept it and it is of good quality. Absolutely love these! They are the perfect fill for my wife and I, super super soft, and they stay very cool. You will definitely want to get some covers that go under your shams, but aside from that there are great! I love thick goose down pillows. This one was quite nice. "Is goose down pillows 100% down filled? Are there any feathers or plastic or cotton in the pillows. Is this goose down from a goose or manmade?" Thanks for your questions. There is no such thing as 100% down. You can never truly separate all of the feathers and feather fibers from the down, however the feathers and feather fibers that are in the down are not visible and you cannot feel them (ie they are not large feathers like you see in a decorative pillow insert). This particular down is 80% white goose Down clusters and is 700 Fill power. Our down comes from geese and the entire process is RDS certified. This means that we are ethically sourcing the down every step of the way. We clean our own down in our factory and it goes through a 3 step process. There is no cotton or plastic in the pillow fill. The outer shell is 100% Cotton. "I never know if I am buying 1 or 2 pillows when the picture shows 2. Why don't you just say 1 king size pillow $. or 2 pillows $?" Thank you for your question. I am sorry that the picture is not clear. We use lifestyle images to show the product as well as product shots but in this case, the lifestyle shot is the one that comes up as the main image. When you purchase this product, you will be buying 1 (ONE) white goose down pillow. I will update the copy to makes sure that this is clear - thank you for letting us know that it isn't. This is a GREAT pillow by the way - its amazing down and is so comfortable to sleep on. Please let us know if you have any more questions. Thanks again! "What do you love about these pillows?" "What is the fill weight (oz) of the standard firm pillow?" "Do these pillows have any feathers in them?" With any down, you can't fully separate the feathers, so you will have some left in the mix. Even the most expensive down out there will have some feathers left in it due to the nature of what down and feathers are. Please be cautious of products that say 100% down because this is not correct. 1221 Bedding follows all guidelines for properly labeling our products. This particular down is a 700 Fill power which means that at least 80% of the mix is 100% Down. Up to 20% can be feathers, but its not the feathers that you think of (like those in a decorative pillow insert) - they are very small and you can't feel the quill. This down is amazing and you won't be disappointed with the feel of the pillow. This one is definitely one of my favorites! Thanks for your question -the pillows are filled and finished in the United States in Ohio. "are these pillows 100% down? (specifically the King Firm pillow)"
These are 330TC 100-percent Cotton Sateen cover filled with 700 Fill Power European White Goose Down.